MALAYSIA LARGEST HALAL CONSUMER EXPO, THE 8TH EDITION OF HALFEST MALAYSIA IS BACK! The 8th edition of HALFEST MALAYSIA is back! Brought to you by SHAPERS MALAYSIA, the founder and developer of the MALAYSIA INTERNATIONAL HALAL SHOWCASE (MIHAS), HALFEST MALAYSIA will be organized in collaboration with the Department of Islamic Development Malaysia (JAKIM) in partnership with Country Heights Holdings Berhad (CHHB). 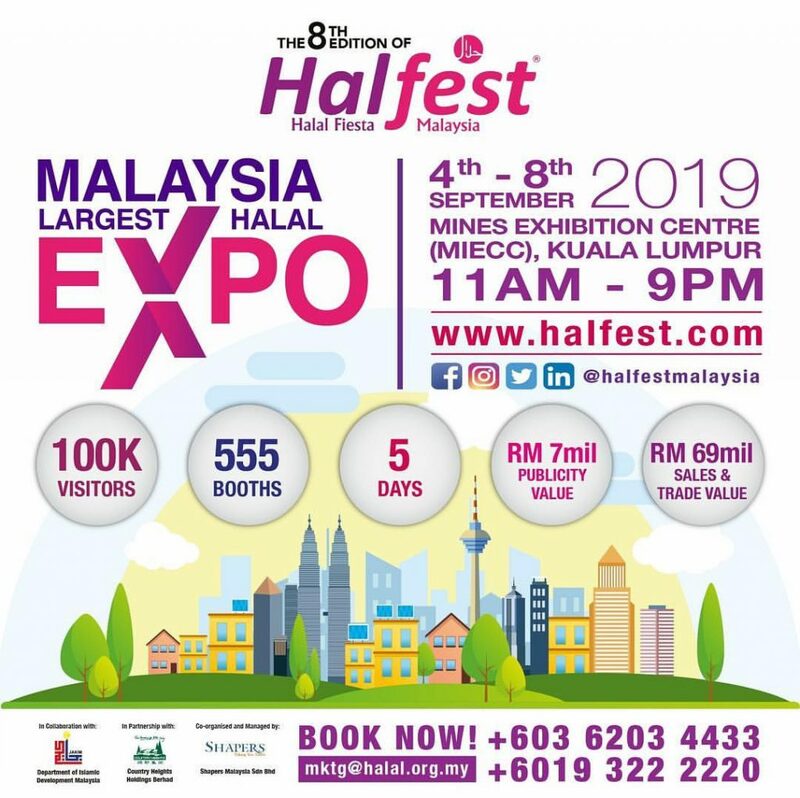 With an expected 100,000 trade visitors and consumers as well as over 500 booths of never-seen-before Halal products and services to be showcased, HALFEST MALAYSIA 2019 will feature enhanced programmes to meet the growing needs of the vibrant and diverse Halal players in this New Malaysia. This year, we play host to the ISLAMIC BANKING, TAKAFUL AND INVESTMENT WEEK and HALAL TRAVEL MART. MAKE YOUR HALAL LOGO WORK FOR YOU! BE SEEN AT THE 8TH HALFEST MALAYSIA, 4th to 8th SEPTEMBER 2019, MINES EXHIBITION CENTRE (MIECC), KUALA LUMPUR. As the 3rd Leading Nation in the World for Islamic Finance, the ISLAMIC BANKING, TAKAFUL AND INVESTMENT WEEK will be the platform for participating Islamic banks, takaful and investment institutions to introduce and promote Syariah compliant investment and Islamic finance instruments while offering expert advice on Islamic loan application and appropriate takaful products to qualified entrepreneurs while reaching out to a bigger consumer market. The HALAL TRAVEL MART will feature all Islamic and Syariah compliant travel industry players in showcasing their packages in this industry worth RM741billion globally where Malaysia’s share is RM29.3billion or 4%. Take this advantage to leverage on the RM7million publicity value and RM69million trade and sales value. HALFEST promises to be an exciting event for the whole family with fun-filled activities for all including children. There are exciting competitions, product launches and demonstrations, free consultations and lots of fabulous prize giveaways, transforming shopping into an experience. This attracts large numbers of visitors to HALFEST and for a chance to get up close and personal with top chefs and local celebrities. 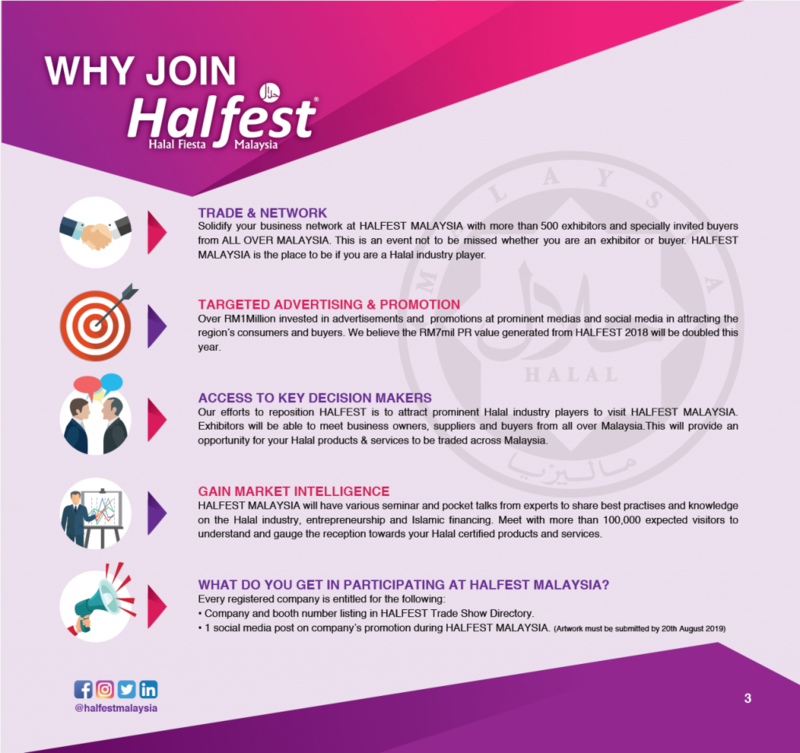 HALFEST MALAYSIA is guaranteed to be exciting and rewarding for both the business community and consumers.